On Friday, May 4, Gastronomica: The Journal of Food and Culture received the Best Publication Award at the James Beard Foundation Awards in New York, NY. 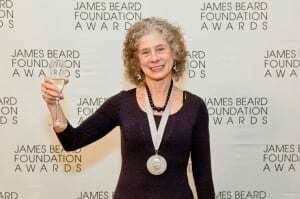 The award was accepted by Darra Goldstein, Gastronomica’s founding editor and the Francis Christopher Oakley Third Century Professor of Russian at Williams College. 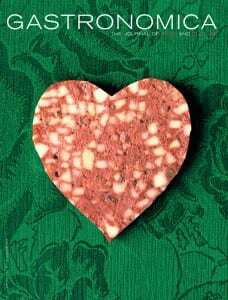 “Since 2001, Gastronomica has proven that food can be the catalyst for meaningful and serious discussions about culture, history, literature, art, and politics. Founding Editor Darra Goldstein has turned her enthusiasm for food into a substantive and intelligent publication that influences us all. In addition to editing Gastronomica, Darra is a Professor of Russian at Williams College. She is a quintessential example of the diverse and unexpected personalities you’ll find talking about food Gastronomica, where poets, artists, professors, opinion makers, and pundits bring a stimulating breadth of perspectives to the table. The honor was shared with Food52.com, a web-based publication and food community started by Amanda Hesser and Merrill Stubbs. While this is the first such honor for Gastronomica, UC Press has had a long history of recognition at the Beard Awards, with past Beard winners including Food Politics by Marion Nestle, The Wines of Bordeaux by Clive Coates, My Bombay Kitchen by Niloufer Ichaporia King, and Encyclopedia of Pasta by Oretta De Vita Zanini, among other finalists. Kate Marshall, Acquisitions Editor for Food and Agriculture, spoke with Darra Goldstein following the event. KM: So, Darra, what’s it like to be honored by the Oscars of the food world? DG: It’s wonderful that a niche publication like Gastronomica was recognized among all the big players in the field, and sharing the stage with so many talented food writers and chefs was thrilling. So I enjoyed the glamour of the evening, not to mention the champagne! KM: Did you meet any food celebrities or influential folks at the JBFA gala? DG: I drive my students crazy when I tell them we don’t have cable TV at home, so I never watch any of the food shows and don’t really follow celebrity. But I did talk to Andrew Zimmern — we’re both Vassar grads — and I was thrilled to see Daniel Humm from Eleven Madison (Gastronomica’s featuring him in the May issue). On the food writing side, it was great to spend time with personal icons like Claudia Roden and Betty Fussell. KM: Gastronomica is one of our highest profile publications. Why do you think readers respond so strongly to the journal? DG: For one thing, it’s gorgeous. Readers adore the covers, as well as the edgy artwork and photography inside. People also like Gastronomica’s wide-ranging content. As one friend said to me, each issue is idiosyncratic, unexpected, and intellectual — the material never gets stale. People really do want to think deeply about food these days, and Gastronomica offers some serious stuff without ever forgetting the pleasures of food. KM: What other food publications do you admire and enjoy reading? DG: All my favorite publications seem to have gone by the wayside. First Cuisine, then the original Eating Well, more recently Gourmet. There is some excellent food writing on Gilt Taste these days. KM: Apart from the James Beard Award, what do you think are your biggest Gastronomica achievements over the past 12 years? Who are you most proud to have published? 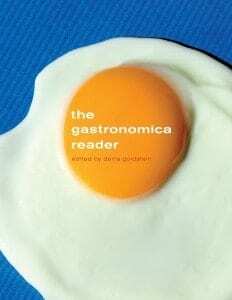 DG: Gastronomica has received some wonderful recognition, including the Prix d’Or at the Gourmet Voice World Media Festival (2004), the UTNE Independent Press Award for Social/Cultural Coverage (2007), and the AAP/PSP PROSE award for Best Design in Print (2009). Last year it was named Best Food Magazine in the World at the Gourmand World Cookbook Awards in Paris. But apart from these very public awards, I think Gastronomica’s greatest achievement has been to bridge the divide between academics and the food world, on the one hand bringing serious writing to the general public and on the other bringing a sense of aesthetics to the world of academic writing. The journal has also given the burgeoning field of food studies a distinctive voice and helped it gain legitimacy. It’s hard to say what I’m most proud of because there have been so many terrific contributions over the years. I collected some of my favorites from the journal’s first decade in The Gastronomica Reader that UC Press published in 2011. I’m proud to have published poets like Louise Glück and Eamon Grennan, photographer-artists like Pinar Yolacan and Hans Gissinger, and writers like Paul Russell and Paul Greenberg. I’m especially happy to have launched the writing careers of many young people by giving them their first publication in Gastronomica.